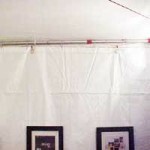 These photos provide ideas for various ways of hanging your artwork in your tent. Artists must supply all their hanging and display materials. We provide ONLY the tent. Artists use a variety of materials to hang their artwork from the poles in their tents; zipties, ropes, thin chains, wires, s-hooks, bungee cords and more. The tent poles are 2″ in diameter, and can withstand approximately 75 pounds of weight hanging from them. They are 10′ above the gound. Artists hang their artwork on fabric covered panels (using velcro or thin hooks), pegboard, wire shelving, grid racks, lattice, easels, painted fencing, professional display racks, etc. They attach their artwork with hooks, clips and velcro. We recommend Pro Panels which provide the easiest possible installation and in our opinion, the most professional look for your display. There is no lighting or electricity in the tents as the festival takes place in the bright, long days of April.